In our previous discussion we came across 'Hibernate Hello World Example with Annotations '. In this particular blog we will see what is hibernate one to one relationship and how to implement it using Annotatons. We will demonstrate the relationship by taking two model classes 'Student' and 'StudentAddress' and try to establish a one to one relationship in between them. According to the one to one relationship each student entry should have a unique address entry in student_entry table. We have created two tables 'student' and 'student_address', every student have an associated address in 'student_address' table. No student can have more than one address entry in 'student_address' table. These two tables are mapped in a one to one relationship using a primary key i.e. 'student_id'. This is the overall project structure for today's discussion. All required files are being explained in the rest part of this tutorial. This is a simple pom.xml containing dependencies to use in a hibernate one to one mapping relationship. 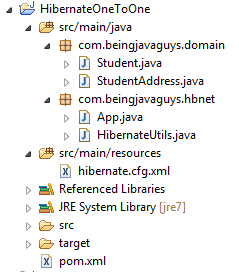 This is a simple xml configuration file to contain code of hibernate configurations and settings. We have added all database related connections settings here along with a entry for each model class to let hibernate know about the relational mappings. This is a simple java class containing code for 'Student' class, the fields of the class are being annotated by required annotations to let the class work as a mapping class to appropriate table in db. @Entity class denoted that the class is being mapped to a table with name specified in '@Table(name = "student")' annotation. @Id tells that the specified column is being used as a primary key in the table and @GeneratedValue makes the specified column a auto-increment field. @OneToOne(mappedBy = "student", cascade = CascadeType.ALL) tells that the particular column is being associated with 'Student' in a one to one relationship. @GenericGenerator tells that the column will have a foreign key relationship with student class's primary key column. @PrimaryKeyJoinColumn species the primary key column to be served to make a foreign key relationship with student table. This is another simple java class used to get a SessionFactory instance, to get a session object from. This is the main class where actual implementation will be made to demonstrate the undergoing functionality. In this particular blog we came across 'Hibernate One to One mapping and, implementation using annotations'. In upcoming blogs we will see 'Hibernate One to Many mapping' & 'Hibernate Many to Many mapping' and Other Implementations in Java.